I was able to tour a hospital laboratory that had already gone through the lean process. 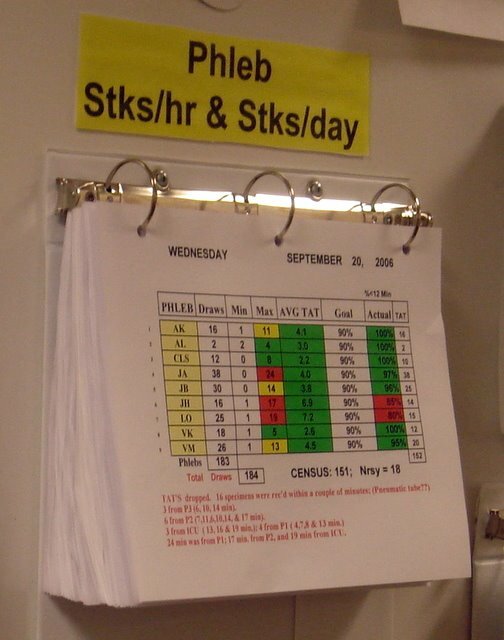 One metric was a daily tally of “sticks per day” (that's what a Phlebotomist — a person who draws your blood — calls it when the draw your blood…. they “stick” you…. maybe not the most customer-focused term). So, I asked what happens when a phlebotomist is “red” for the day, fearing the worst. That was absolutely right, the right answer. You can't turn it into a competition, whether it's in manufacturing (which production cell built more) or in patient care. I was very happy that they were using quantitative metrics for a constructive purpose, rather than for punative reasons. One of the problems preventing someone from hitting their daily goal could be a lack of training, or maybe they aren't following the standard work. It's leadership's job to coach them to follow the standard method, if they aren't, so they can get standard results. By the way, the “red” in the chart refers to the “TAT” (Turn Around Time — cycle time, basically) not the number of draws/sticks.